SHENZHEN, China--(BUSINESS WIRE)--Semtech Corporation (Nasdaq: SMTC), a leading supplier of high performance analog and mixed-signal semiconductors and advanced algorithms, announced its participation in a new forum, LoRa Technology Innovation Forum, which will be held in the Shenzhen Exhibition Center on April 11, during the China Information Technology Exposition (CITE) conference. 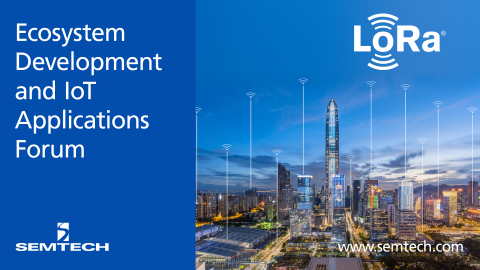 Semtech will be working with members of the ecosystem and solution manufacturers in China to demonstrate its LoRa® devices and wireless radio frequency technology (LoRa Technology). The forum will present the LoRa-based ecosystem to China and share successful, proven deployments of LoRa Technology in its many vertical markets including smart cities, utilities and buildings. There will be a total of 21 keynote speeches over the course of the day. At the forum, Semtech will conduct in-depth discussions with China’s top ecosystem partners including ASR, Alibaba Cloud, Aliyun, China Unicom, CLAATEC, Easylinkin, GTI, H3C, Lierdam, Menthink, Si Xin, Sundray, Tencent Cloud, Winext, Yosmart, and ZLG supporting institutions including China Electronic Standardization Institute, and China Academy of Information and Communications Technology. The forum will focus on the innovative applications of LoRa Technology, implementing a LoRa-based business model, technology development trends, ecosystem cooperation, interoperability certifications, and device communication. Semtech will also invite many LoRa-based solution providers, including Lierda, EasyLinkin, Manthink, Yosmart, ASR, and H3C, to introduce their latest gateway and sensor products. The forum will be held in Molly Hall on the 6th floor of Shenzhen Exhibition Center on April 11. All statements contained herein that are not statements of historical fact, including statements that use the words “will,” “expect,” “designed to,” or other similar words or expressions, that describe Semtech Corporation’s or its management’s future plans, objectives or goals are “forward-looking statements” and are made pursuant to the Safe-Harbor provisions of the Private Securities Litigation Reform Act of 1995, as amended. Such forward-looking statements involve known and unknown risks, uncertainties and other factors that could cause the actual results of Semtech Corporation to be materially different from the historical results and/or from any future results or outcomes expressed or implied by such forward-looking statements. Such factors are further addressed in Semtech Corporation’s annual and quarterly reports, and in other documents or reports, filed with the Securities and Exchange Commission (www.sec.gov) including, without limitation, information under the captions “Management’s Discussion and Analysis of Financial Condition and Results of Operations” and “Risk Factors.” Semtech Corporation assumes no obligation to update any forward-looking statements in order to reflect events or circumstances that may arise after the date of this release, except as required by law.